In unsurprisingly but encouraging news, the cost of solar power technology has been decreasing rapidly over the last few years – with India seeing solar system pricing isntalls falling as low as 65c/w. 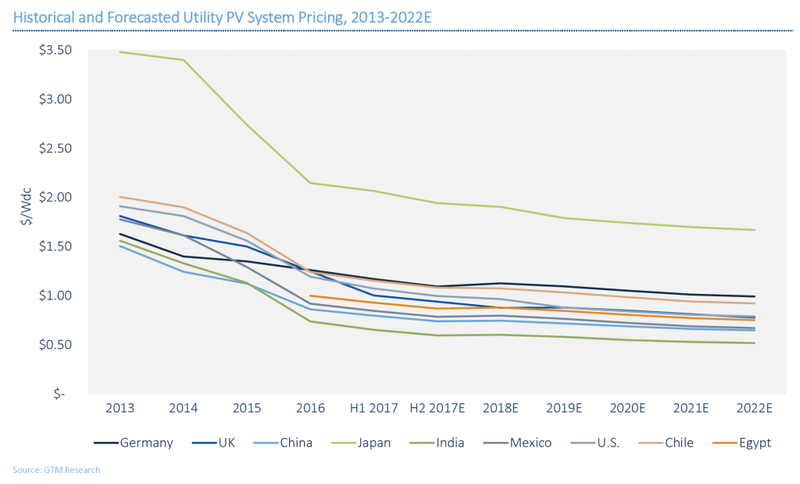 GTM Research‘s market analysis team have released a PV system pricing forecast – and solar analyst Ben Gallagher have released a graph showing that $/Wdc could reach as low as $0.50 by 2022. Even Japan, which has traditionally had a very high cost of installing PV solar systems due to additional engineering concerns from heavy wind, earthquakes, and erosion, has seen an extremely sharp drop in 2016. Lower cost of solar is obviously a good thing, but there are also some problems when you see a ‘race to the bottom’ like this. Why is Indian Solar so cheap? Solar projects in India are decided via a competitive tender process, which, when coupled with extremely cheap labourers and engineers, results in prices that are $0.11c / watt cheaper than even Chinese panels. As discussed above, this is ostensibly a good thing but Ben Gallagher’s report highlights that there are quite a few inherent problems with competitive tenders and its effect on quality, and, additionally, implications for the future of these projects. “The competitive tender process has a harmful side effect: There are reportedly widespread concerns about the viable lifetimes of many of the systems currently installed, as it is suspected that many were hastily constructed using poor-quality components. Developers will look to [engineering, procurement and construction providers] to safeguard their investment by raising installation and procurement quality-control standards and reduce long-term O&M headaches,” Gallagher wrote in his report. According to GTM, the top 10 inverter vendors accounted for 79% of global shipments in 2016 and they expect this trend to continue. Global PV inverter sales reached 80 gigawatts in 2016 (compared to 59 gigawatts in 2015). The UK has the lowest price for solar in Western Europe due to the usage of string inverters (where the PV solar array is wired in series rather than parallel, which allows the higher voltage DC input circuitry to be produced cheaper and with lower internal losses – which increases efficiency in the inverter, as well as between the array and the inverter). As solar panel technology increases rapidly, it’s interesting to see which methods companies are using to get the best results out of their inverters as well as storage. All three are progressing at an exciting pace and the second half of 2017 will undoubtedly see more advancements in the field. Have a look at our article on perovskite solar cells if you’re interested in some of the experiments currently being undertaken to lower the cost of solar power! Solar panel safety – product & installer guide. WA Solar – Installs rising, but so is ‘energy inequality’.